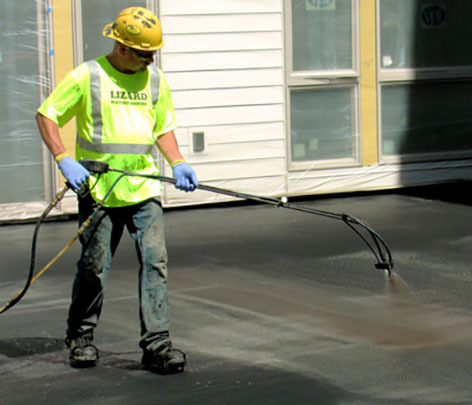 Choose the EPRO Underslab Protection System That’s Right for the Job. 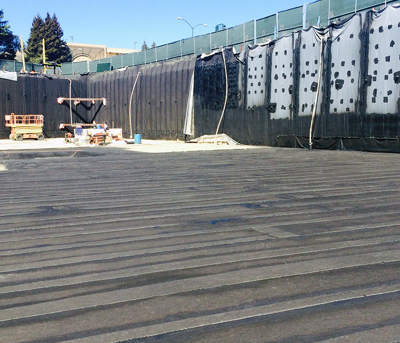 EPRO Underslab Protection Systems are ideal for structures with hydrostatic conditions and sites with potential hydrostatic conditions that may also contain the threat of methane gas or contaminant vapor intrusion. These systems are designed for structures with the following foundation types: pile, pad, mat, strip footings, grade beams, and buildings with moisture-sensitive flooring or finishes. If you are interested in City of Los Angeles Methane Mitigation, take a look at our Proformance M line of products. Designed to provide the most redundant and highest level of below-grade building protection available, E.Protect+ Underslab provides unparalleled protection against hydrostatic conditions, chlorinated volatile organic compounds, and petroleum hydrocarbons. 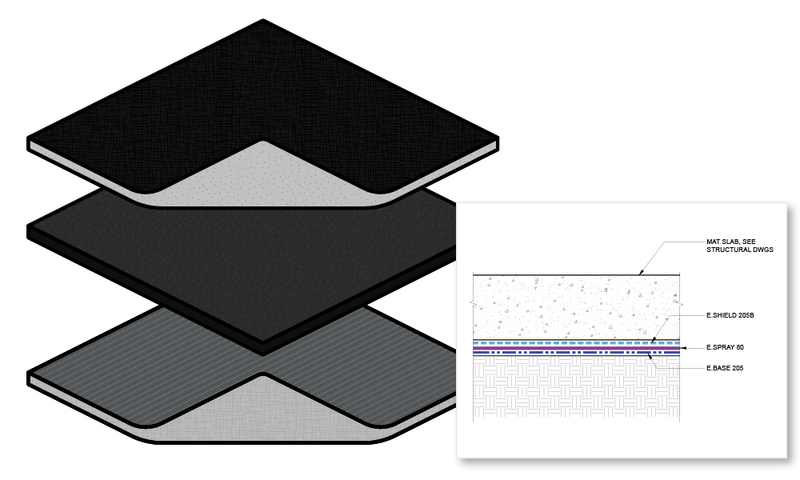 E.Protect+ Underslab is the first system ever developed to combine in one system, what others might utilize as three completely independent systems. E.Protect+ is designed for those who require the highest level of performance. It is designed to be compatible with all types of building foundations. Ideal for below-grade building foundations requiring underslab waterproofing protection, but where site conditions or budget considerations might not require maximum protection. 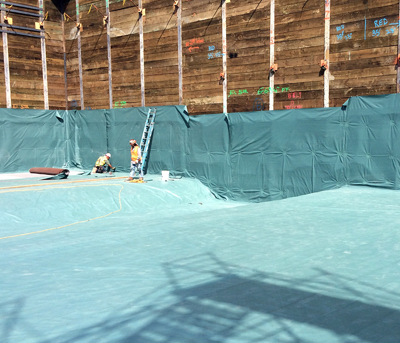 E.Protect Underslab leverages three key waterproofing materials: high density polyethylene (HPDE), spray-applied polymer modified asphalt (PMA), and bentonite, to create redundancy against a wide range of project conditions and chemicals of concern. 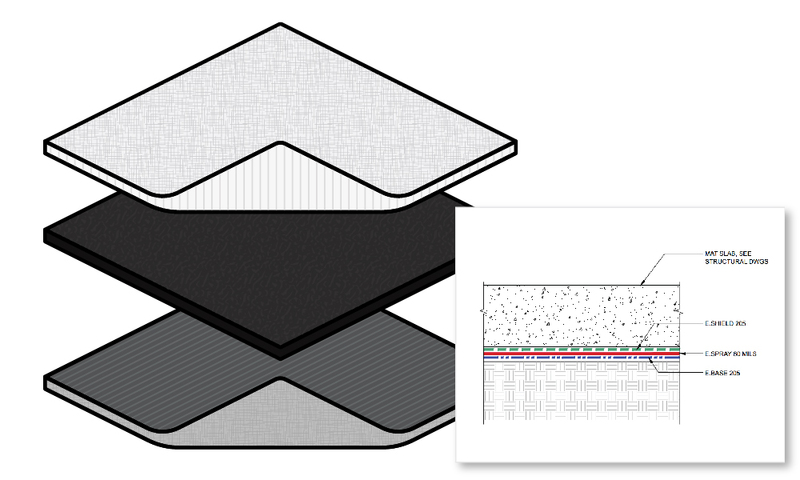 E.Protect Underslab is designed to be compatible with all types of building foundations. E.Proformance Underslab is ideal for below-grade building foundations not subjected to hydrostatic pressure, but that require waterproofing protection and a single source warranty for both waterproofing and contamination such as, methane gas, volatile organic compounds (VOC’s), or aeromantic hydrocarbons. 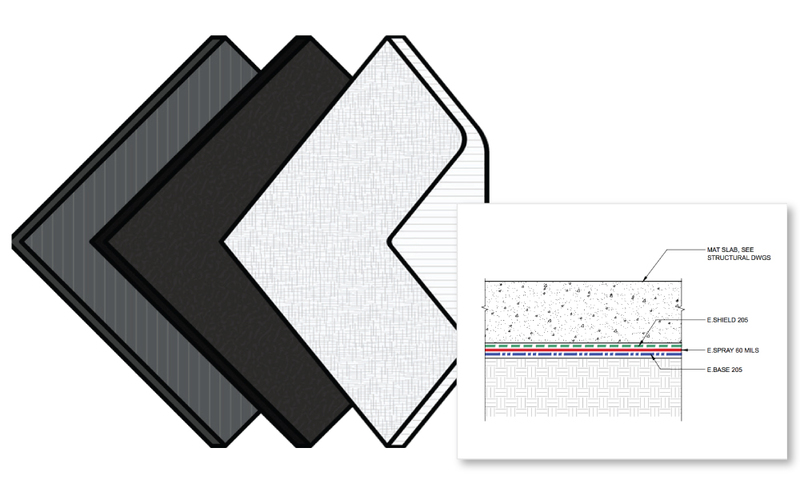 E.Proformance Underslab has been awarded a United States Patent, is approved by both City and County of Los Angeles for methane mitigation, and approved by various environmental regulatory bodies for chemical vapor intrusion. As with all E.Series, it is designed to be compatible with all types of building foundations. Designed specifically for waterproofing and methane mitigation projects being constructed within the City of Los Angeles, or Los Angeles County, E.Proformance M is has the necessary approvals to effectively keep buildings dry and safe. E.Proformance M is also resistant to volatile organic compounds (VOC’S) and aromatic hydrocarbons, and awarded a US Patent. 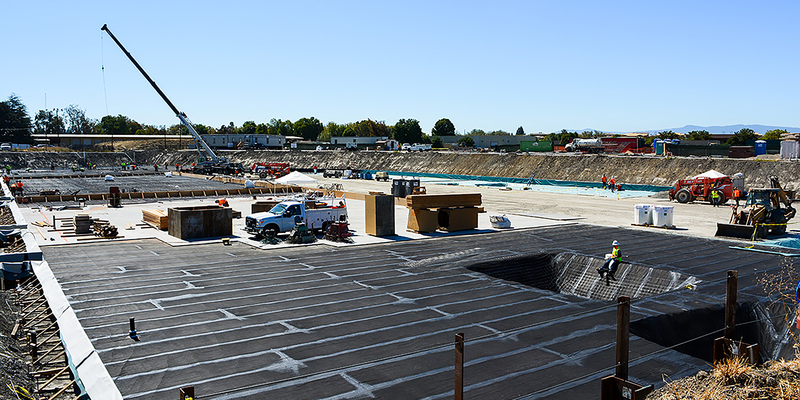 For below grade methane mitigation applications in the City of Los Angeles with shored walls, the underslab system extends from the underslab up the interior face the shoring wall for blindside protection. For projects outside of the City of Los Angeles, the blindside vertical wall application E.Proformance M is not required. Contact EPRO for the proper assembly recommendation. E.Proformance M is designed to be compatible with all types of building foundations, as well as, cast-in-place poured concrete or shotcrete foundation walls.